Pickle recipe for fruits or salted fish (Kurau). Salted fish can be used instead of mango etc. Wash salted fish and dry in the sun. Cut into small pieces and fry a little before putting into pickle gravy. Put oil in pan. Fry ground ginger and shredded ginger and garlic. Remove ginger and garlic from oil after about 2-3 minutes. Set the fried ginger and garlic aside. Fry all ground spices and alba in the same oil. stirring well till well cooked. Add vinegar, sugar and a little salt. Allow to simmer for a few minutes. Add the fried ginger and garlic and the preserved mango (or other fruit) which has been scalded with boiling water and drained. Stir, adding more sugar and salt if necessary. When boiling, transfer pickle to porcelain bowl and allow to cool before putting away in bottle. Mango – (Use 12 green mangoes to make 2 teacups dry mango preserves). Halve, remove seeds and cut each half into 4 pieces lengthwise. Place in porcelain basin, sprinkle on top 2 tbsp salt. Shake the bowl so that mango gets thoroughly mixed with the salt. Place porcelain bowl in hot sun everyday, until mango is dry enough for use, shaking the bowl to mix contents once in a while. Rumunia – (Use about 700 g of small green rumunia). Halve each fruit and remove seeds. Use same method of preserving as for mango. Blimbing – Add salt to blimbing. This has more water than mango and rumunia. When drying in the sun spread blimbimg on flat basket. Leave porcelain bowl in the sun too so that the liquid can evaporate. Put blimbing in liquid during the night. Limes – Cut each lime 3/4 way up from the bottom into 4 sections. Use the same method of preserving as for mango. 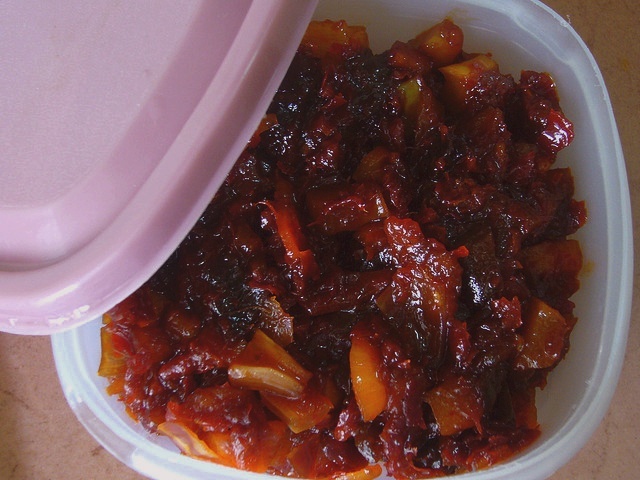 Brinjal – Brinjal makes a good pickle but it will not keep as long as mango or lime pickle. 5 young green brinjals will be enough for ingredients given in recipe. Cut brinjal into 1 1/2" x 1.2" after removing all seeds in the centre. Dry pieces of brinjal in hot sun for 2 hours before using.